Hello and welcome to the 102nd installment of the SWD. Syrian Arab Army made a new wave of advances against Islamic State in eastern Aleppo and reached the outskirts of Maskanah. Today’s captures include Al-Bouajouz, Qasr al-Boujaouz, Kharab al-Khadharaf and Al-Faraya. Islamic State downed SAA‘s drone southwest of Deir Hafir near the village of Al-Tueus. Last night a VBIED exploded in the eastern part of rebel-held Azaz, at least four people were wounded in the explosion. Shortly after the VBIED attack, an individual wearing a suicide vest detonated himself in the northern neighborhoods of the city. Rebel infighting in northern Aleppo countryside between Jabhat al-Shamiya and Faylaq al-Sham backed by Liwa Fursan al-Thawra has reportedly ended. Jabhat al-Shamiya with the support of several other rebel groups managed to eliminate both hostile groups. Infighting has allegedly killed around 100 and wounded 200 fighters, remaining fighters and commanders of Faylaq al-Sham and Liwa Fursan al-Thawra have been imprisoned. Syrian Democratic Forces captured Kudayran village west of Raqqa from Islamic State, 10 IS fighters were killed during the clashes in and around the village. 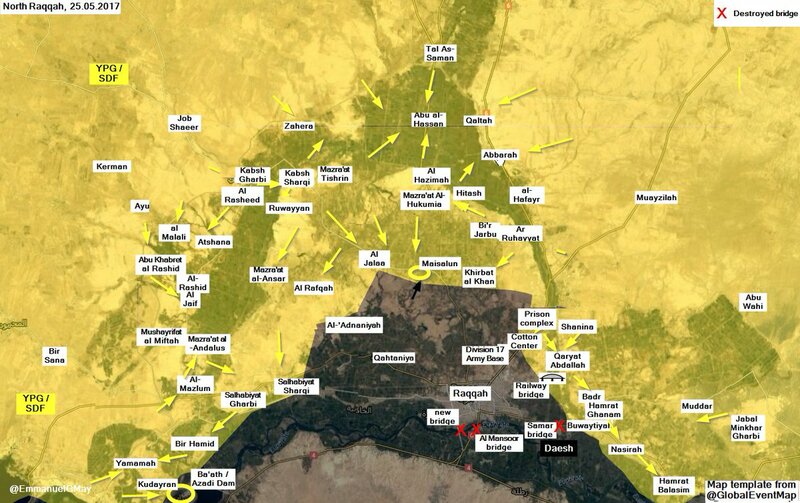 With this capture, all of the areas north of Baath dam are now under SDF control. Katibat Ahrar Asqat which defected from Ahrar al-Sham to Hayat Tahrir al-Sham has defected back to the former. Defection was confirmed by Ahrar al-Sham in a statement. Huge advances were made today by Syrian Arab Army and allies in eastern Homs governorate. The main reason for these advances could be Islamic State’s withdrawal from the areas captured, to back this thesis, there were reports from pro-government sources claiming Syrian Arab Air Force destroyed 36 IS’ vehicles fleeing from Al-Buseirah. First advances were made on the fronts east of Al-Qaryatayn and south of Palmyra which resulted in units from these two fronts linking up. During the first push some of the captured localities include Jabal Nasrani, Jabal Ghanim, Al-Buseirah, Jabal Zuqaq Khalayil, Al-Sawwanah, Tell al-Sawwanah and Khunayfis. Second wave of advances was mainly focused on the territory southeast of Al-Qaryatayn, but advances also occurred east of it. The second wave linked up south Palmyra – southeast Al-Qaryatayn front with the one north of Al-Seen Air Base. Furthermore, due to these advances, the road between Damascus and Palmyra is fully under SAA‘s control, which means that Palmyra now has two supply routes leading to it. Some of the localities captured during the second wave include Jabal Kuhlah, Jabal Butum, Khan Unaybah and Bir Khan Unaybah. SAA also captured ground from Maghawir al-Thawra and other US-backed Free Syrian Army factions operating in east Homs, Al-Ulainiyah and surrounding mountains have been captured by SAA. Rebels in East Qalamoun are now fully encircled by SAA and any future attempts at relieving the siege would have to go through SAA. The rebel encirclement situation can potentially result in various scenarios, one of them being a siege and SAA‘s assault on the region, the other possible scenario would be rebels accepting reconciliation and being incorporated into National Defense Forces or Qalamoun Shield. In the past, SAA assisted rebels in East Qalamoun against IS which caused some rumors to form, such as the rebels settling their cases once the threat of IS is gone in the area. Now that the IS is pushed out of the area, we might see that rumored reconciliation or some other scenario, only time will tell. 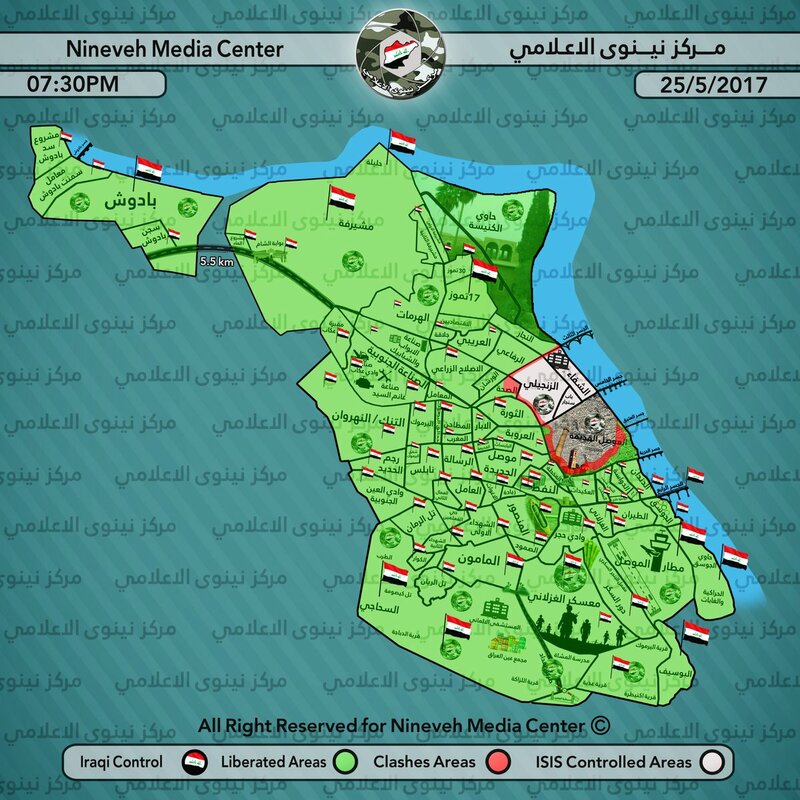 Situation in west Mosul remains unchanged territory-wise, as Islamic State is still resisting in the small area still under their control in the city. Since Islamic State is only present in Old Mosul district and a couple of districts north of it, resources have been limited so the main weapon has changed from SVBIEDs to snipers. According to Amaq, 10 Iraqi soldiers were killed by Islamic State’s snipers across the districts of Al-Najjar and Al-Thawra and neighborhoods of Bab al-Toub and Bab Jadid in Old Mosul district. Statement from IS’ Amaq Agency claimed CJTF-OIR‘s and Iraqi airstrikes/shelling killed 101 civilians and injured another 199 in Mosul during the past five days. 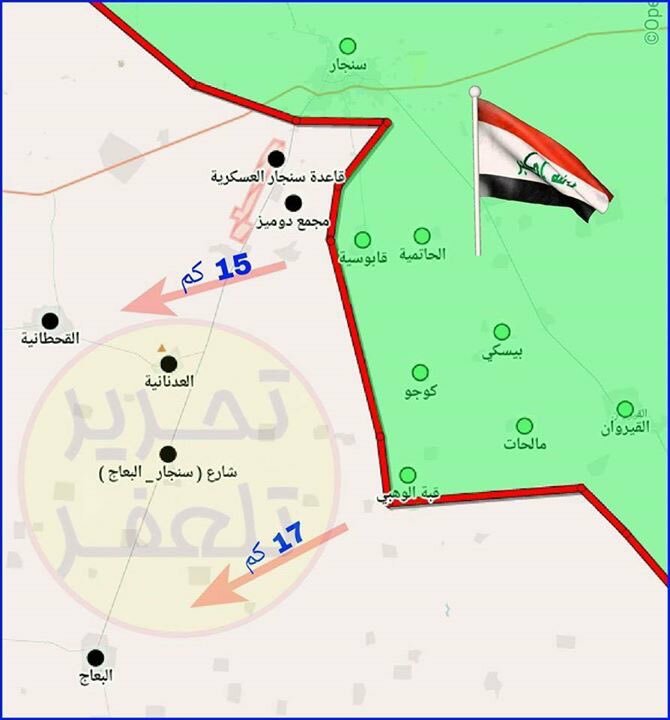 Al-Hashd Al-Shaabi’s (Popular Mobilization Units) operation which started last night already resulted in significant advances. Iraqi forces captured Arfeea, Quba al-Wahbi, Tell Ghazi, Kojo, Amihalat, Al-Hatimiyah, Qabousiyah, Beeski al-Shmali and Beeski al-Janoubi from Islamic State west of Al-Qayrawan region. In the newly captured village of Kojo and in Al-Mawalih village, Al-Hashd al-Shaabi reportedly lost a T-72 tank, a BMP and a Humvee due to IS’ anti-tank guided missiles. Islamic State’s improvised explosive device reportedly destroyed Al-Hashd al-Shaabi’s vehicle killing everyone on board in Al-Qalak village, east of Baiji. Islamic State’s fighters reportedly ambushed members of Iraqi Federal Police on the road between Hamrin and Muqtadiya. According to Amaq, several policemen were killed and wounded in the ambush. On the 24th of May 2017 CJTF-OIR has conducted 21 strikes in Syria. CJTF-OIR‘s main focus in Syria at the moment is Tabqa-Raqqa-Deir al-Zour region where they did 16 strikes supporting SDF‘s operation against IS destroying five fighting positions, four IS dump trucks, four vehicles, two artillery systems, a front-end loader, a weapons cache and an IS barge. Other areas where five strikes occurred are Abu Kamal and Al-Hawl destroying three IS oil tanker trucks, two IS well heads, two IS fuel tanks, a front-end loader, a crane, a bulldozer and a VBIED. Full report on CJTF-OIR strikes conducted in both Syria & Iraq can be found here.